Why is ‘swing’ called ‘swing’? Am I supposed to swing my hips a lot? Swing describes the music that we dance to and the feeling it evokes, not a swinging motion of the body. Swing refers to the sense of driving ‘feel’ or rhythmic ‘groove’ that you just can’t help intuitively responding to by say, tapping your feet or nodding your head (we say, “This music really swings!”). Swing is also a jazz music style from the 1930s, with the concept of the ‘swung note’ – a rhythm of unequal notes where the weaker beat is emphasised (unlike classic music). So swing dance simply means dancing to swing music – not because there’s a lot of swinging motion in your body! No! No partner is required for socials or for classes. In classes, we rotate partners, so even if we have more of one gender than the other, everyone will get to participate. You don’t need a partner for our social dances either. Lindy Hop is a social dance, so you should be dancing with everyone, plus dancing with everyone will make you a better dancer more quickly. Shoes should be flat, smooth soled and not easily come off your feet. Our studio requires students to wear non marking, clean shoes that have not been worn on the street. Socks are also OK. High/stiletto heels, and flip flops are not recommended. Swing dancing can be quite active, so wear something you can move comfortably in and won’t get too hot in. Our classes and most weekly socials are casual dress. For weekend dances, especially if there’s a band, we recommend that you dress a little nicer. Can you recommend me some music to practice to? 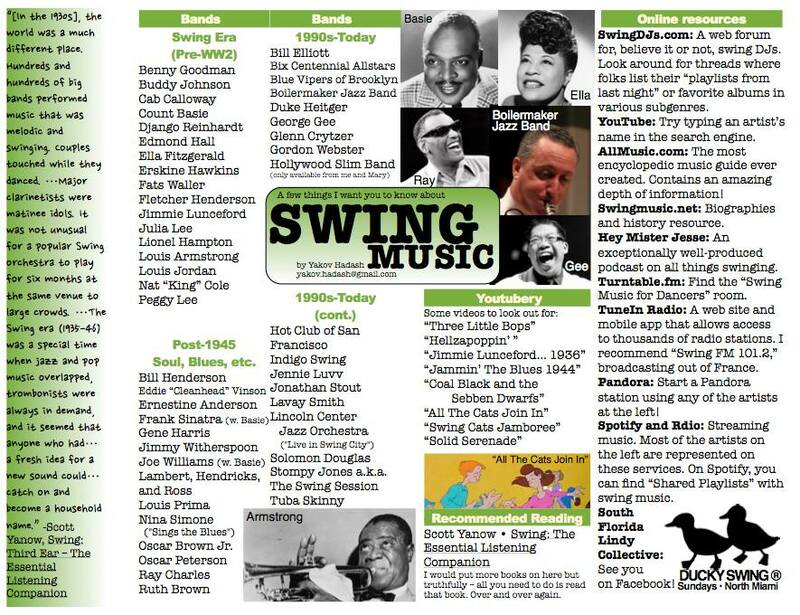 Check out this guide to swing music, this list and Jazz On Line. A great way to discover some of your own swing dance favorites is to use an online music site like Spotify or Pandora Internet Radio which ask you to enter the name of an initial artist or song title and then finds music that is similar in genre, instrumentation, rhythm and feel. Try entering a song or artist from one of the compilations you like and see what you get! What’s the difference between the free classes and the studio courses? Our free Wednesday night intro classes are fun 30 mins ‘taster’ sessions and we welcome anyone who would like to give swing dancing a try! You can always drop in on this and no experience or partner is required. We teach simple swing to get you dancing right away. If you would like to learn more (and there is so much more! ), including about the culture, music and history of swing as well as the dance, we recommend joining our studio courses which are in a focused studio environment and will guide you to really progress over time! What is the age of people who attend your events? We have all ages! The most common age range is 20 – 50s. What’s the best way for me to find out about upcoming events, socials and classes? Two ways: (1) opt to receive our once-a-week emails, and (2) visit this website regularly. We also have many interesting things posted on our Facebook Page. Joining our email list is the best! We also have Facebook groups you can join if you’re interested in our Friday Night Parties or Sunday Practices. I am visiting Hong Kong. Are there any lindy hop/ swing events happening during my stay? Welcome! We love meeting visiting dancers. Check our regularly‐updated calendar to see what’s happening. I really want to get good. What should I do? (1) Go social dancing. Consistent practice in an “authentic environment” is the key! (3) ASK people with more and less experience than you, to dance. (4) Attend workshops and international events. (5) Take risks. Make mistakes. Have fun! What is the Shim Sham, and how do I do it? The Shim Sham is credited to Leonard Reed and was originally a tap routine. Today it is danced by Lindy Hoppers all over the world, and recalls the roots of both tap and swing era rhythm. Considered to be the “Father of Lindy Hop,” Frankie Manning led a team of dancers, Whitey’s Lindy Hoppers, in the 1940s swing dancing in the famous ballrooms of Harlem, New York, including the Savoy Ballroom and the Cotton Club. After the second world war and shifts in popular music and culture, Frankie returned to the floor, teaching and inspiring thousands of dancers worldwide for the remainder of his life.